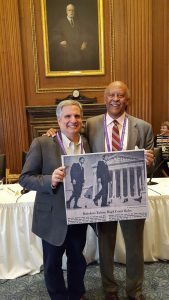 At the 2016 USCPAA Homecoming, five former Supreme Court Pages who were present for the historic decision to desegregate schools and its immediate aftermath assembled May 27, 2016 to share their personal memories of the time, 1953 to 1967. Hutchinson, who at the time was Marshall of the Court told how the Court first considered the case in the spring of 1953 but was unable to make a decision. The Court supporters of desegregation felt it was important that a decision of this magnitude should be unanimous, he explained, and the votes simply weren’t there. Warren felt strongly that the Court should follow the law and immediately appointed the first Black Page, George Bush, effectively desegregating the Page School in 1954 – the first in the nation as a direct result of Brown. Frederick Saunders, like Bush a junior high school student when Brown was announced, said there was tremendous excitement about the decision at his Washington, D.C. school. Saunders was the second Black Page appointed to the Court in 1955, and he and Bush were the first Black graduates of CPS in 1957. “My parents and I were shocked when I was appointed,” said Samuel Williams of being selected as the third Black Page in 1957. In 1958 he gained some visibility during arguments in favor of continued segregation of schools in Little Rock, Ark., when a newspaper article noted that he, “a colored youth,” served water to a white attorney arguing for segregation. “It was my job,” Williams shrugged. By 1963, Brown was less top-of-mind but Black Pages at the Court and at CPS were still the exception, recalls Ernest Wilson, who served from then until 1966. “There were only one or two Black students at school and we were conscious of that. There was a lot going on in terms of Civil Rights and remember this was the beginning of JFK’s term as President.” When Kennedy was assassinated later that year, Wilson remembers delivering the note informing the Justices of the shooting to their private conference that day. Luci, Wilson was quick to point out, was a friend of the Pages and often attended their parties. “But going to parties at Luci’s house was always more fun,” Wilson noted. Even after knickers were abandoned as uniforms for House and Senate Pages, they persisted in the Court. “Young people our age visiting the Court often snickered at the knickers,” admits Williams. 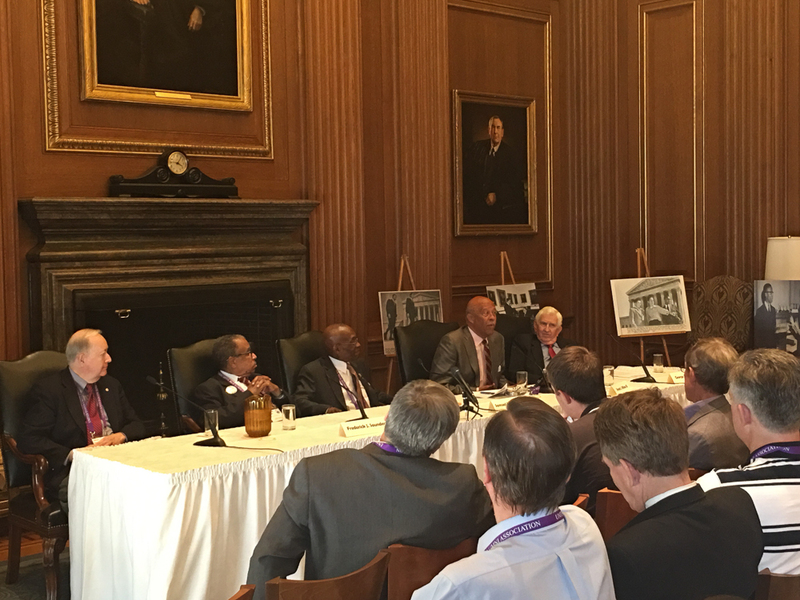 Back in the day, Williams said, Pages had to be 5’4” or shorter so as to not tower over the Justices’ chairs. Then a 6’1” Wilson arrived. The Chief Justice took one look at him in knickers, and banned them. George Hutchinson is a native Washingtonian who served for 47 years in the judicial branch of the Federal Government. He worked for the U. S. Supreme Court in various positions, including a Page and an assistant Marshal and Crier of the Court opening and closing each session of the Court for 10 years. He then served as Marshal and later Clerk of the U. S. Court of Customs and Patent Appeals and when that Court was merged into the U.S. Court of Appeals for the Federal Circuit in 1982 he served as the first Clerk of that Court until his retirement in 1985. He has served as counsel to the firm of Finnegan Henderson, Farabow, Garrett and Dunner since 1985 and is presently is a Trustee of the Federal Circuit Historical Society. Frederick J. Saunders was born in Washington, D.C. where he attended District of Columbia Public Schools until he was appointed to his positions as a Junior in high school at the Supreme Court in 1955. 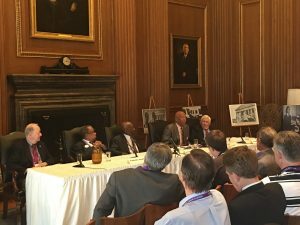 At that time, he was the second Black person in the history of the Court to be appointed. Charles Bush was the first in 1954. 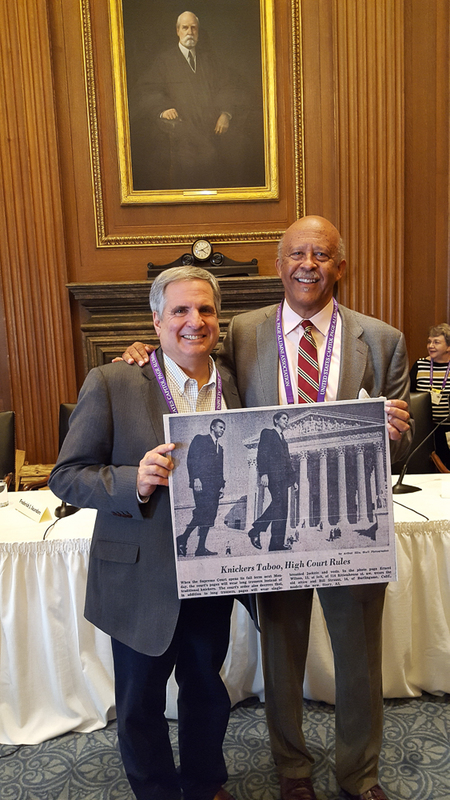 Fred and Charles were the first Black students in the history of Capitol Page School to attend and graduate in the class of 1957. Upon graduation from Page School, Fred attended Lincoln University in Pennsylvania class of 1961 where he was on the Wrestling and Baseball teams. Fred started his career in the Federal Government with the Immigration and Naturalization Service. He moved on to the United States Postal Service where he held positions with the Consumer Advocate’s Office and in Marketing and Customer Service. He retired from U.S. Postal Service Headquarters in Washington D.C. in 1996 with thirty-eight years of Government service. He was the Advance Man for the Board of Governors of the United States Postal Service, who are appointed by The President of the United States. Upon retirement from the Postal Service, he was appointed Business Liaison for a member of the Maryland State Senate. He met with the business community with an emphasis on problem solving and developing community strategies. Fred and his wife Joan Veronica have two children, three granddaughters and two great grandsons. Fred and Joan have been happily married for fifty-three years and reside in Fort Washington, Md. Samuel Isaiah Williams was the third Black Page appointed to the Supreme Court in 1957. In September, 1958, he witnessed the arguments in favor of continued segregation in the Little Rock, Ark. public schools. After graduating from CPS in 1960, Samuel earned a B.S. in Electrical Engineering from Howard University, an MBPA from Southeastern University and a Ph.D. in Public Policy and Administration. His professional experience includes the White House Executive Office of the President, the Office of Management and Budget (OMB) and the Department of Commerce. Samuel was a Captain in the U.S. Army in Vietnam and was awarded the Bronze Star for Service. He currently lives in Bowie, Maryland, located near the state capitol of Annapolis. Ernest J. Wilson, III is Walter Annenberg Chair in Communication and Dean of the Annenberg School for Communication and Journalism at the University of Southern California. He is also a professor of political science, a faculty fellow at the USC Center on Public Diplomacy at the Annenberg School, a member of the board of the Pacific Council on International Policy and the National Academies’ Computer Science and Telecommunications Board, and a member of the American Academy of Arts and Sciences. He served on the board of the Corporation for Public Broadcasting from 2000 to 2010, the last year as chairman. Dean Wilson served as a Page in the U.S. Supreme Court from 1963 to 1966.